Re-decorating doesn’t have to cost a fortune, especially in the bedroom. With a few simple changes you can refresh your bedroom and make it feel like a whole new room whilst hardly spending anything. Time and effort are more valuable commodities than cold hard cash. 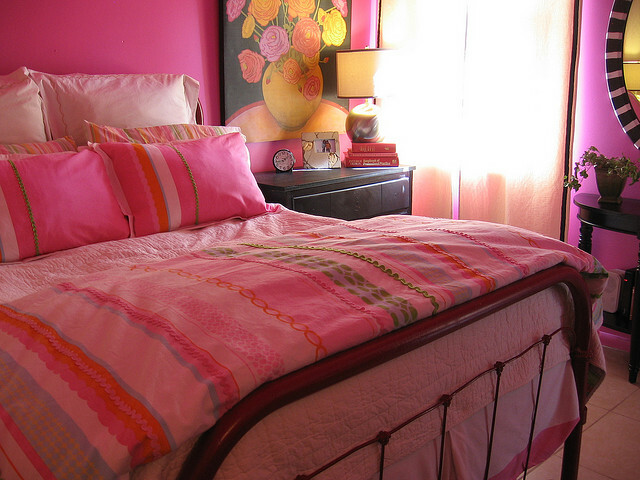 Get creative and experiment with different styles and you could end up with your dream bedroom for just pennies. Sometimes if things are feeling tired and samey, just re-arranging the furniture you already have can make a world of difference. Just because the bed is in what appears to be the most logical place doesn’t mean it can’t go somewhere else. Remember, you can easily change things back if you don’t like them and it costs nothing to try. 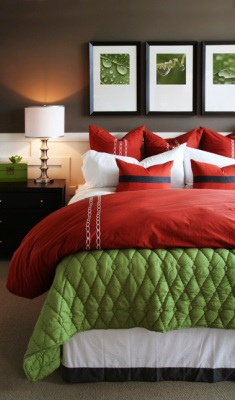 You may love bright, bold colors but feel they are not conducive to a good night’s sleep. Get around this by painting the wall behind your headboard in the color you love, and then paint the other three walls in a complementing pastel shade. When lying in bed you will be surrounded by a sea of calm, pale color, but by day your eye will be drawn to the vibrant block of color on the other wall. The bed is the focal point of the room. Dress it up and you immediately make the whole room seem different. You don’t have to go for whole new bedding sets either – a colorful or patterned throw or comforter that matches what you already have can brighten up the room in seconds. If you have time on your hands but not money this is a fabulous way of getting some truly unique furniture. Either use what you already have or look in second-hand shops or at car boot sales for some cheap wooden furniture. Strip it down, sand it and paint or varnish in the colours of your choice. A rug is cheaper than re-carpeting the whole room and can make a huge difference to the overall appearance. Choose one big rug if you have wooden or laminate flooring, or a couple of smaller pieces if they are to sit on top of carpet. Houseplants not only brighten up a space in terms of colour but they also take toxins out of the air, making your bedroom a safer place to sleep. Choose Peace Lilies or English Ivy for easy to care for plants that will do you a lot of good. When you see hotel beds they always look fabulous. The reason for this is that they are never left flat. Grab a few extra headboard pillows and scatter cushions to make your bed look as luxurious as one in a five star hotel. This post was provided on behalf of Hotelcontractbeds.co.uk, leading mattress and hotel beds supplier.